Travel has been on my mind this morning. The arrival of my new camera is making my feet itchy...it is a Camera travel virus....strange but true. 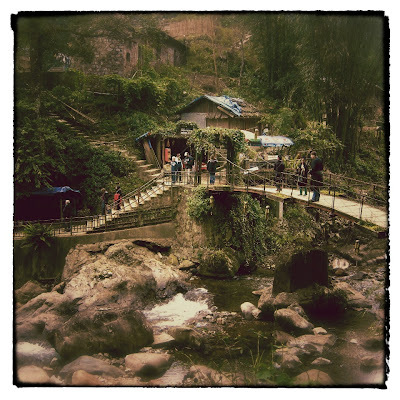 Now I wish I had owned my beautiful Sony NEX-5N camera when we went to Sapa,Vietnam...(read more) last winter. I think I would have come home with better pictures and more possibilities. Here is a picture we took on the trail to Cat Cat Village last December. They have been edited using iphoto and Snapseed. Could I have done better before I downloaded the photo with the new camera? Maybe. Bottom of the trail to Cat Cat Village. Taken with my husbands Nikon, unedited. the red showing. Or how about more vibrant colors? I set the camera to do that before I shoot. has been changed using a grunge setting, edge blur and frames. Now I have added the Sony to my bag of tricks. I have discovered that professional photographers may be cheating just a little...it is amazing! I saw an article in the NYT called Paths to a More Fluent Vacation recommending 10 language programs...five for those of us that like free and five for people with deep pockets. I didn't see any that taught any of the languages spoken in Vietnam. I could have used that when we were in the country last December. But if you are going to Europe or Japan there are some that might be very helpful. 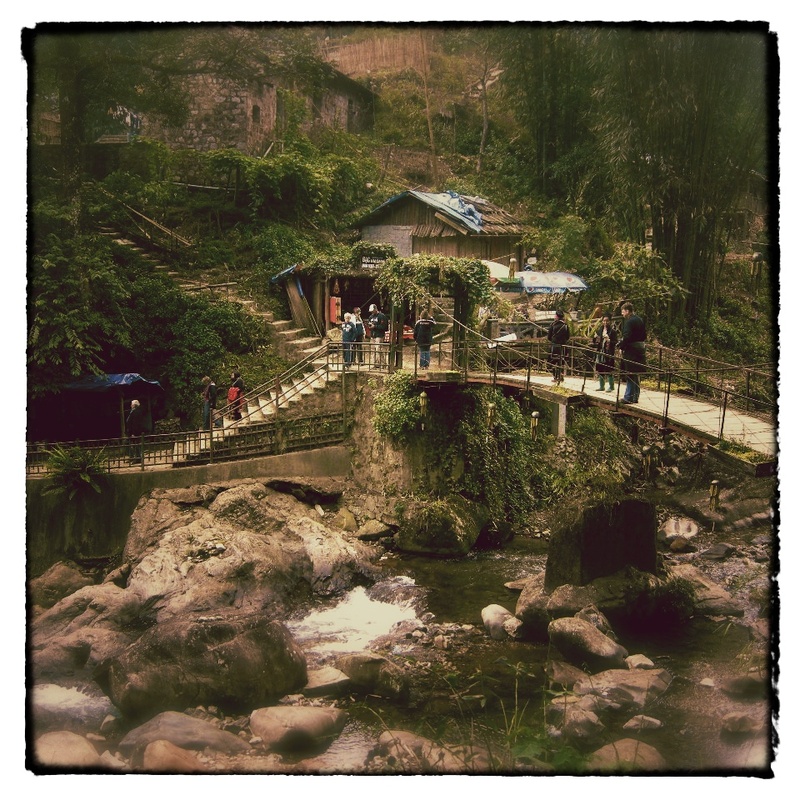 I wanted to learn a little of the H'mong language but the truth is the people could speak such good English in Sapa. The first woman that began talking to me in perfect English surprised me. I am sure I looked puzzled. It turns out that in that part of Vietnam that is at the eastern end of the Himalayas there are still schools teaching English to the hill tribes. I don't know if that is a left over from the Vietnam war. I am told that the American used the H'mong people as spies. Have a wonderful day. Let me know if you have any questions by leaving a comment. I would like it if you would beam me up to twitter.com or to your Facebook account. Thanks. Become a follower if you are not one already. I like that a lot! New cameras definitely make you want to get out there and see and do things, don't they. I've never heard of Snapseed. I may need to check it out. I use different programs for different things (and depending how much tweaking needs to be done). I have Photoshop but know so little about it that I usually end up making the photos look funky. I have Picasa for minor tweaks and recently started using PicMonkey for some really cool effects (and ALL resizing). Lisa, You are so right about the camera...I am snapping everything in sight! Five years ago, I settled down in Thailand to retire. Since then, I’ve traveled to many countries in Southeast Asia, and I think that Vietnam is the other country where foreign retirees seem most happy. I find the country warm and charming and like everything that makes it feel like a little paradise. From my personal experience, however, I’ve found that in Thailand it’s much easier to find someone to explain the local real estate law and then proceed to make investments. If I ever choose to leave Thailand, I would definitely try out Vietnam. For right now, I’m perfectly content and think I made a great decision to retire and invest abroad.